FEMALE suicide bombers are being fitted with exploding breast implants which are almost impossible to detect, British spies have reportedly discovered. The shocking new al-Qaeda tactic involves radical doctors inserting the explosives in women's breasts during plastic surgery — making them "virtually impossible to detect by the usual airport scanning machines". MI5 has also discovered that extremists are inserting the explosives into the buttocks of some male suicide bombers. Terrorist expert Joseph Farah claims: "Women suicide bombers recruited by al-Qaeda are known to have had the explosives inserted in their breasts under techniques similar to breast enhancing surgery." The lethal explosives called PETN are inserted inside plastic shapes during the operation, before the breast is then sewn up. The discovery of these methods was made after London-educated Nigerian Umar Farouk Abdulmutallab came close to blowing up an airliner in the US on Christmas Day. He had stuffed explosives inside his underpants. Hours after he had failed, Britain's intelligence services began to pick up "chatter" emanating from Pakistan and Yemen that alerted MI5 to the creation of the lethal implants. 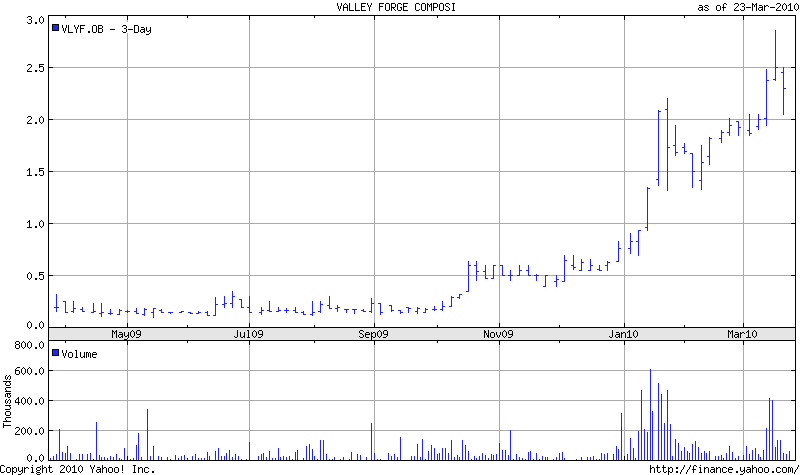 The small cap spec play on this is Valley Forge. (VLYF). I had posted a video of their technology when it was on Fox on January 14. Here's that clip. Their technology was developed in conjunction with Livermore Labs. The company website is here. 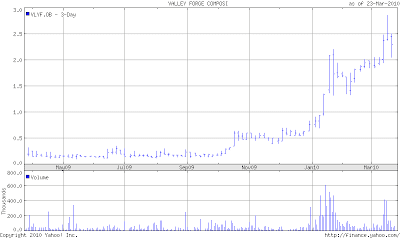 RPM2 Inc, a New Delhi, India based company, represents Valley Forge for all VLYF related security products. They are in talks with several major airports in India as well as the Bureau of Civil Aviation in New Delhi to bring in the ODIN. Currently, discussions are ongoing with the AERB in Mumbai, for demonstration dates and for formal approval. As with any small cap name, you need to do your own due diligence.